Almost three years ago, Teresa went to three doctors, all of whom advised her to abort her baby, saying that the prognosis was bad for both Teresa and her baby. Teresa suffered from a severe case of Grave's Disease, and the doctors assured her that the baby would be retarded. 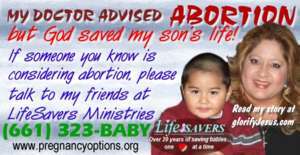 But as she sat in the parking lot of the abortion chamber, Teresa encountered Ione Rardin, a grandmotherly woman who encouraged her to consider God's plan for her baby's life. Teresa had recently accepted Christ as her Savior and knew that God would not want her baby to be aborted, no matter what the baby's condition was. But she also believed that God could heal herself and her baby. God answered Teresa's prayers (and the prayers of others who interceded for her), and today both Teresa and her baby (now a little boy, named Moses) are healthy, thankful that God sent someone to save them from abortion. Teresa is writing up a first-hand testimony, which will appear here soon. Please check back to learn more about how God displayed his power in their lives. Teresa hopes that by sharing her testimony, other people's lives can be changed. If you have a testimony you would like to share, please contact us!